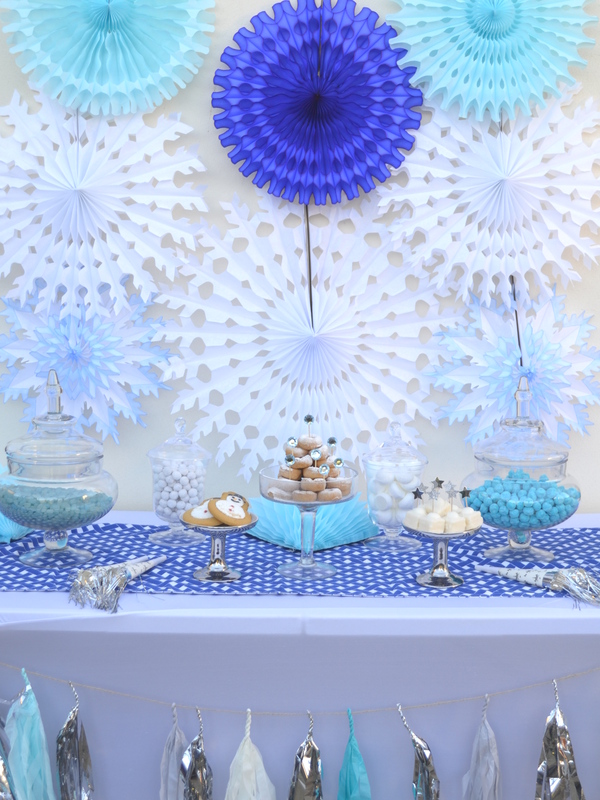 I just knew I had to create a dessert table backdrop with them. Just even adding a few makes a huge impact! 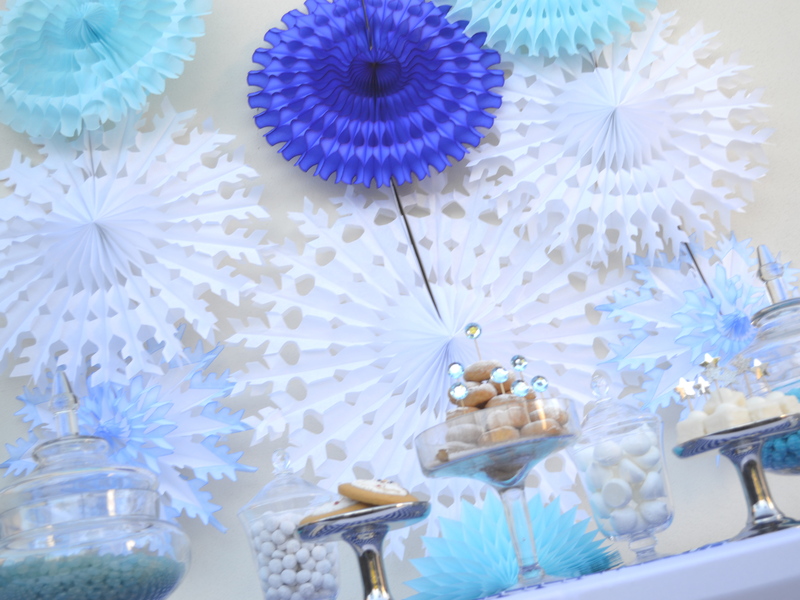 I love the traditional white snowflakes, but I absolutely LOVE the blue and white frosted snowflakes. The photos on my website don’t really do them justice, definitely need to learn some new photography skills! 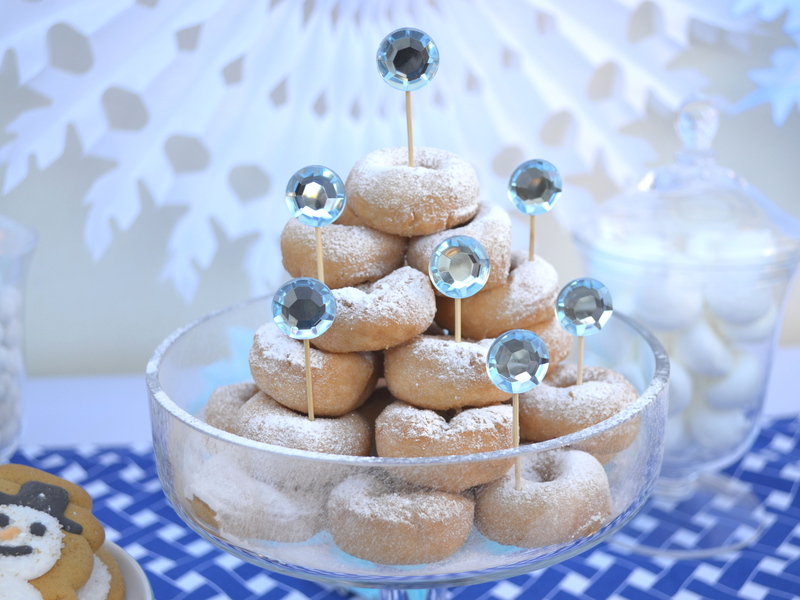 A tower of mini doughnuts is one of the easiest and cheapest ways of adding some impact to your dessert table at home. 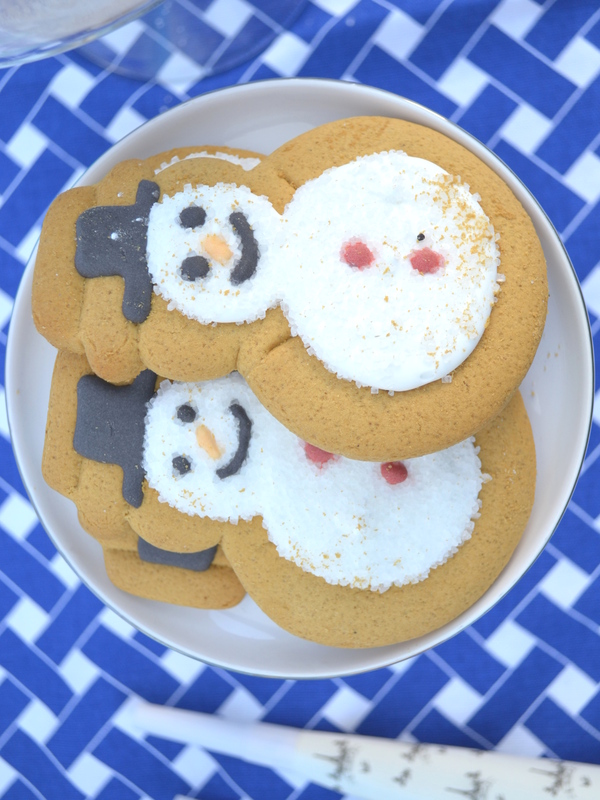 To tie in with the Christmas theme add a sprinkle of icing sugar. I have blinged them up by adding some embellished cake toppers. 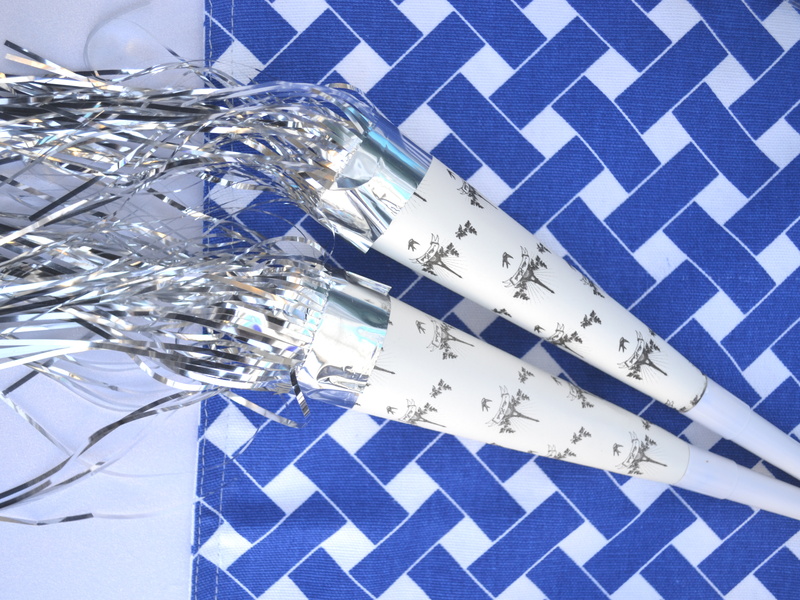 Some silver striped straws are perfect for Christmas and New Year celebrations. As well as gold and silver stripes, chevron and stars we also have the most adorable red snowflake paper straws which are now available from our shop. 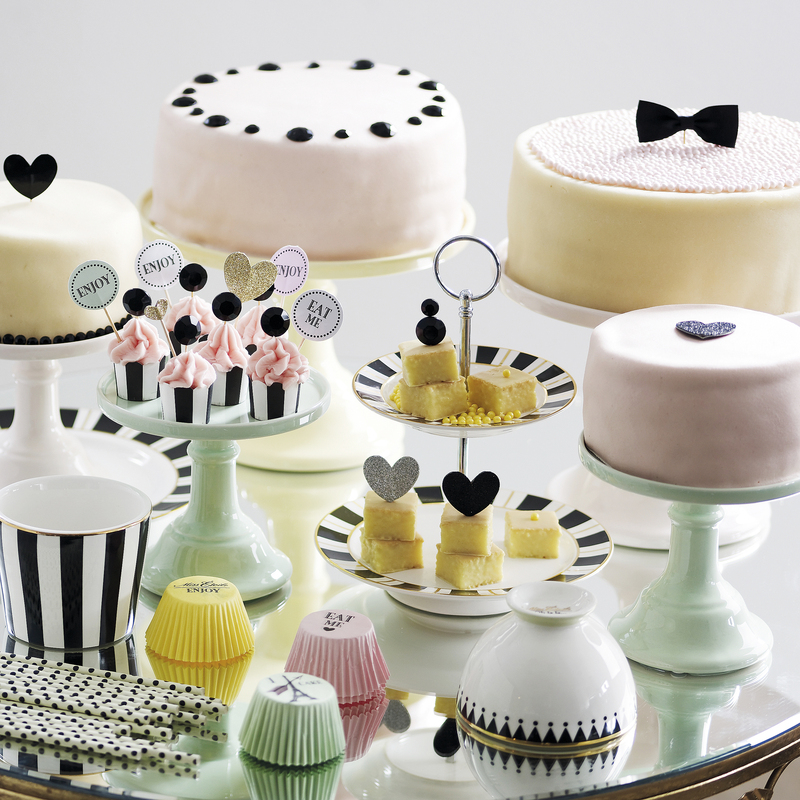 All the cake toppers you see are from the Danish brand Miss Etoile which we have been stocking from last month. Their products are simply gorgeous. As well as those we are stocking silver and gold vintage bird cake stands. You can see the silver version above, each has a lovely bird printed on the top of the stand. So much love for this! 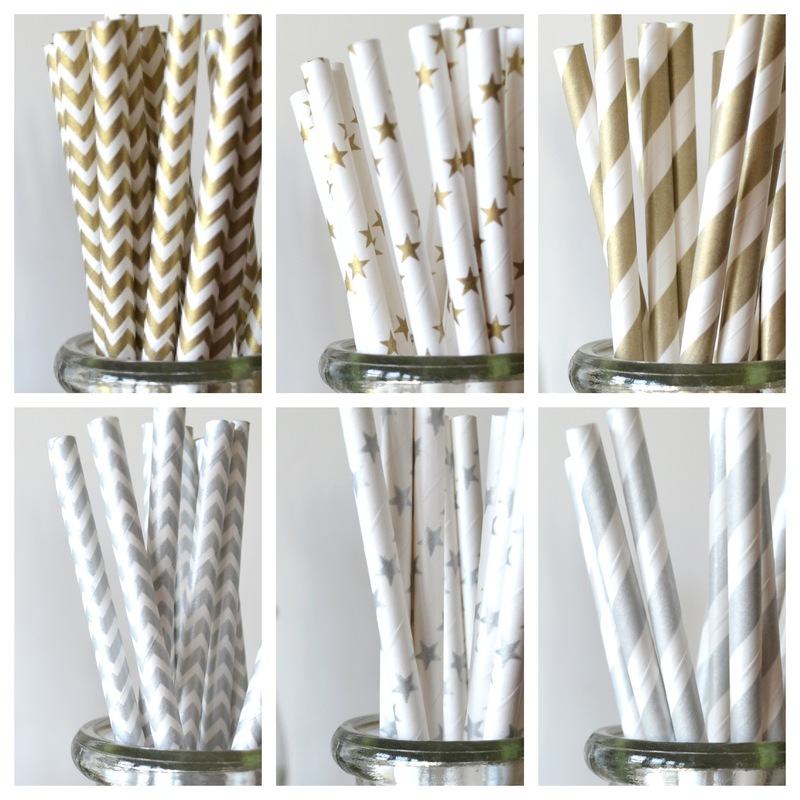 We are so excited to be stocking some gorgeous new straws. They not only come in the best patterns ~ stripes ~ stars ~ chevron, they are available in gold and silver. Yep, you heard right. I can see these being so popular at Christmas. My favourite is the gold chevron, what’s yours? We are currently selling these for £3.25 in a packet of 25. You can check them out on our website here. I know it has been snowing but I am already thinking about ice cream. It seems a tad inappropriate that I am blogging about ice cream when it’s snowing outside, but oh well we all need a bit of cheering up! I have just added an ice cream section to the website, yep that is right. I’m expecting all my stock to sell out within days with this heatwave. LOL! We have added all our Sucre Shop printed ice cream spoons and have the most gorgeous ice cream cups. Don’t worry, we will remind you of this again when the weather starts to warm up..! In love with Bakers Twine and a little Pinterest inspiration..
Yay! A new addition to our online shop – gorgeous bakers twine!! We are currently stocking 6 colours including yellow, red, orange, green, brown and black. We are also looking at expanding our range with some glittery options. Anyway I digress, I wanted to share some ideas via Pinterest on what you could use your baking twine for. So here are my Five top picks! Wrap your sweets in twine! 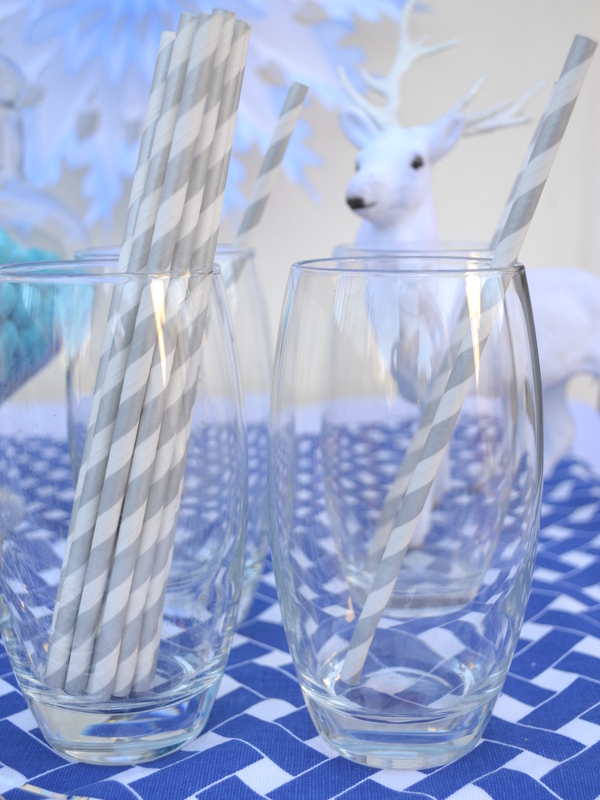 Dress your drinks up with twine, and why not? We hope you enjoyed our little Pinterest party of inspiration! Go over and take a look. 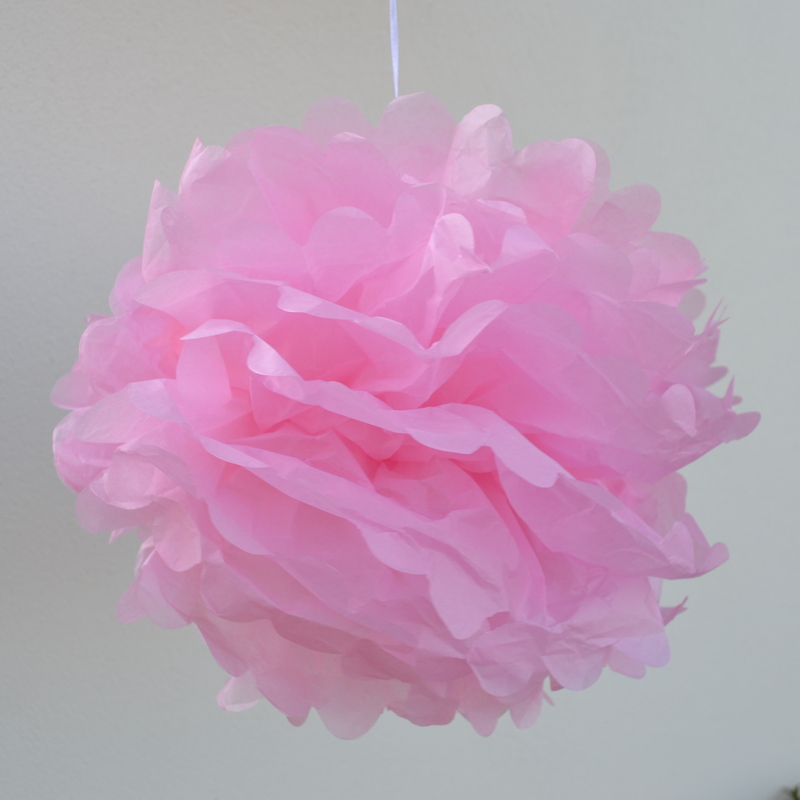 We are so pleased to be stocking some gorgeous tissue pom poms. 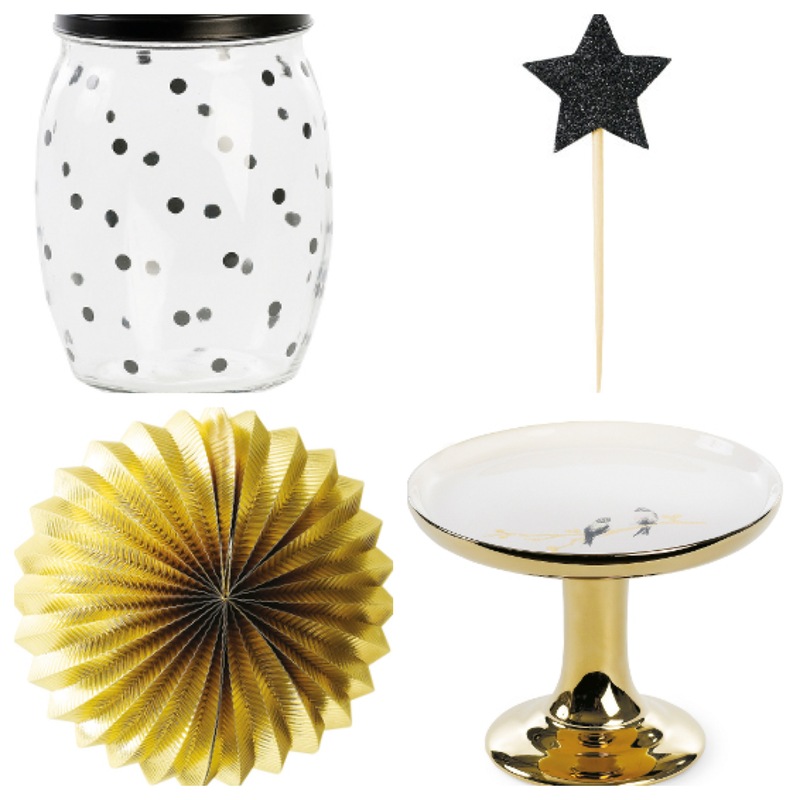 They are such a simple decoration yet have a massive impact when styled at your event/home/shop. Some of our customers are surprised when they arrive flat packed. The reason for this is they simply do not travel well in the post when they are ‘fluffed’. 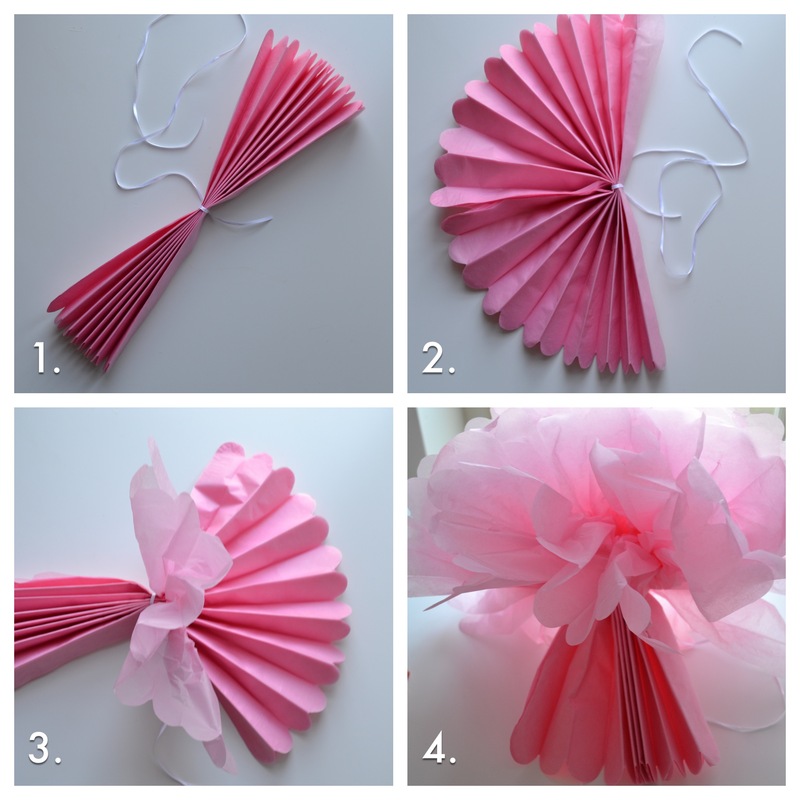 In all our pom pom packs we do include instructions, but I thought I would just write a quick tutorial and include a few piccies to help you along the way. Step 1: You will receive your tissue pom pom something like this. Step 2: Fan out your pom pom. Usually one side at a time is perfectly fine. Step 4: Once you have fluffed one side, then you can continue the other side by repeating the above step. You should then have your finished pom pom! Most pom poms appear slightly oval shape, so you can use your hands gently to create a more rounded shape. And this is the finished outcome….. Voila! Well if you haven’t heard the news yet The Sweet Hostess will become an official stockist of Sucre Shop utensils. These little beauty’s are currently stocked in the US so it’s fab that I have finally got my hands on this fab party accessory! On our website you will currently find the initial range we will be stocking, but we have plans to extend this in 2013 as we assess what is popular here in the UK. To check out the range that will be available soon you can visit our shop here. 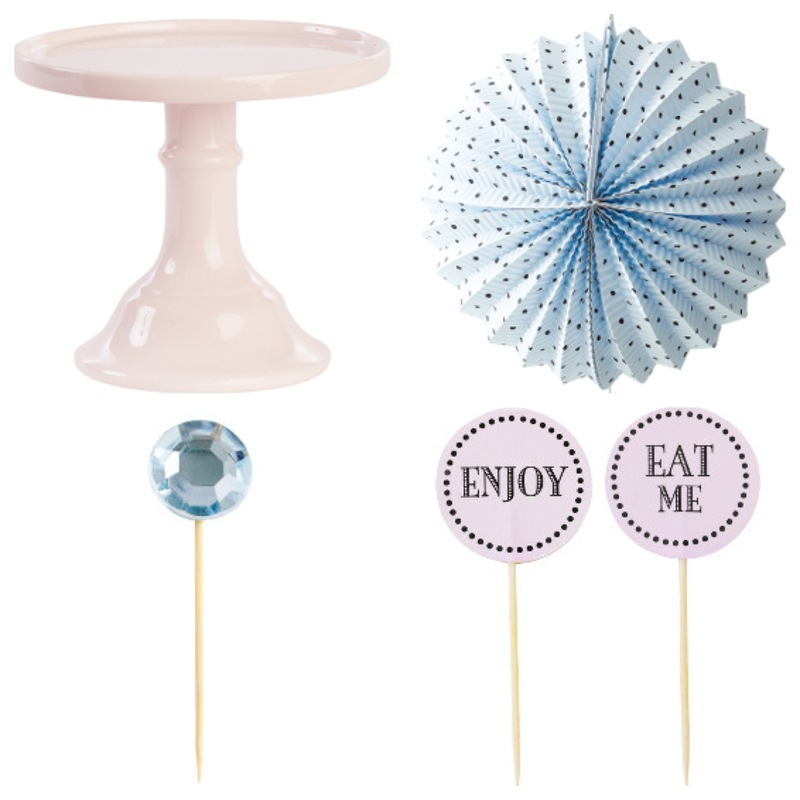 There are so many great ways you can use these spoons for your event giving your party instant pizazz! We love this ‘Go fly a kite’ party theme which features chevron and rustic vibes via Party Wagon. Love the way that they created the little ‘cloud on a spoon’ to compliment the theme perfectly. Genius! Rainbow parties are fast becoming popular in the UK with so much decoration potential with all those amazing colours. Check out this wonderful rainbow jelly idea via Kara’s Party Ideas. Little wooden spoons are placed within the jelly creating a ready to eat party snack. Winning. This is something I often do myself at parties, as it is quick and effective snack to the sweet table and the kiddies love Jelly, you just can’t go wrong. 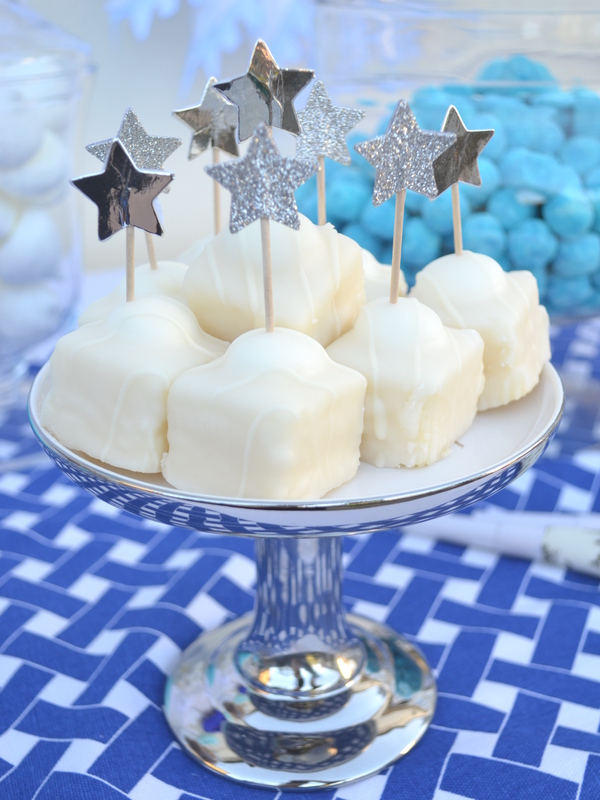 I found this party idea via Catch My Party. 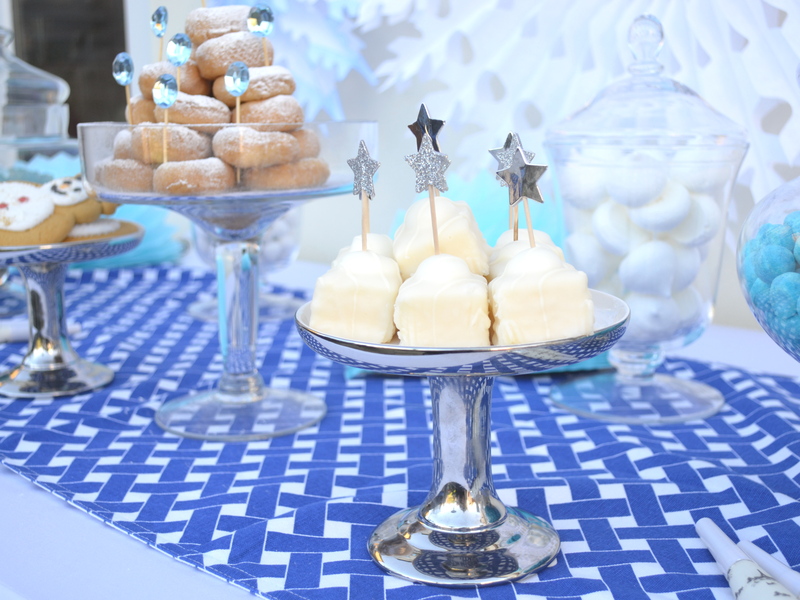 The little sweet jars are such a great party favour or snack. Obviously you could change the label or sweets to match your theme. In this case the spoons are attached to the outside of the jar. As this chic baby shower demonstrates party spoons are not only for the little ones. I love how elegant the berries and cream look in this clear pot. As I write this post I am snuggled up on the sofa drinking tea, glad I am inside out of this cold cold weather. I am still tempted to add this image of ice cream. It looks really delicious! 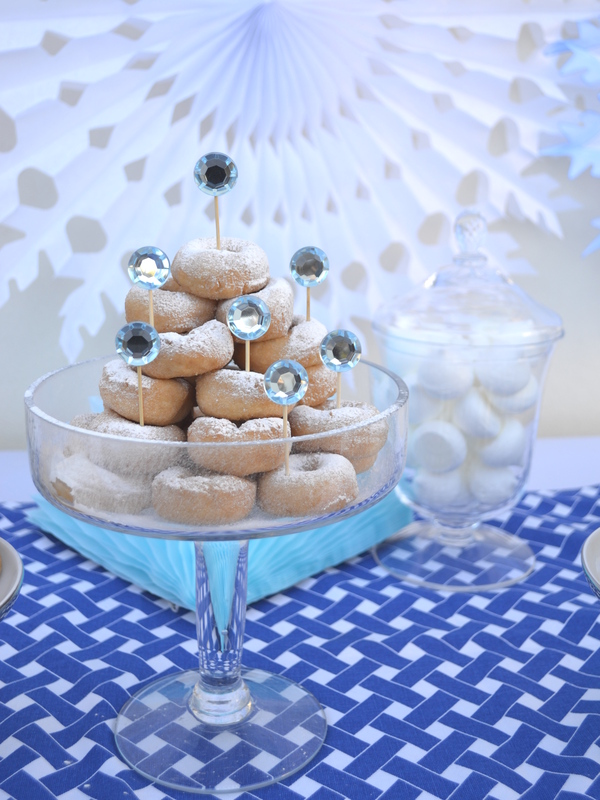 The party comes via HWTM check out this blog post for some great carnival party inspiration ideas. We would love if you could leave a comment or provide your own party ideas using these cute wooden spoons.